For the PDF files, you will need Adobe's Acrobat Reader. An easy jack-o-lantern for Hallowe'en. Diagrammed by Himanshu Agrawal. Intermediate. An easy jack-o-lantern for Hallowe'en. Diagrammed by Hadi Tahir. Intermediate. This armadillo was the result of a challenge by my friend, Paul Lalonde. You can see a photo of it in the Gallery. High intermediate. A set of leaves to be used to display Kawasaki's rose. This was originally designed for the "old" rose, but works almost as well for the "new" one. Doug Philips calls this a calyx. High intermediate. An exercise in exploring the possibilities of a single base. Each chess piece is folded from the same-sized square. High intermediate. A bride and groom set I designed in 2004 as favours for a friend's wedding. Since there were over 350 guests, I suggested we print out instructions and provide origami paper for them to make their own favours, hence the title. Intermediate. The much requested Eastern dragon. High intermediate. Certain models by John Montroll required "guesstimating" to find some landmark points. Based on the work of some Japanese folders, I have diagrammed some accurate ways of finding these landmarks. Low intermediate. Instructions for how to produce rectangles using silver and golden ratios. The silver ratio is used for the A series of papers (such as A4 paper), and is 1:square root of 2. The golden ratio forms a rectangle such that if you cut off a square, the remaining rectangle has the same ratio as the original rectangle. Low intermediate. A high intermediate snowflake, created at the request of Doug Philips. An intermediate snowman and hat, just in time for Christmas 2004. The one-fold stegosaurus was created in response to a joke request by Jonathan Baxter. Simple. Partial crease pattern only (not a full set of instructions). A yuan bao is a small metal ingot that was used in ancient China as money. Most of them were of silver, but gold ones did exist. High intermediate. Xander's new rabbit design. Not yet rated. A high intermediate Santa Claus. 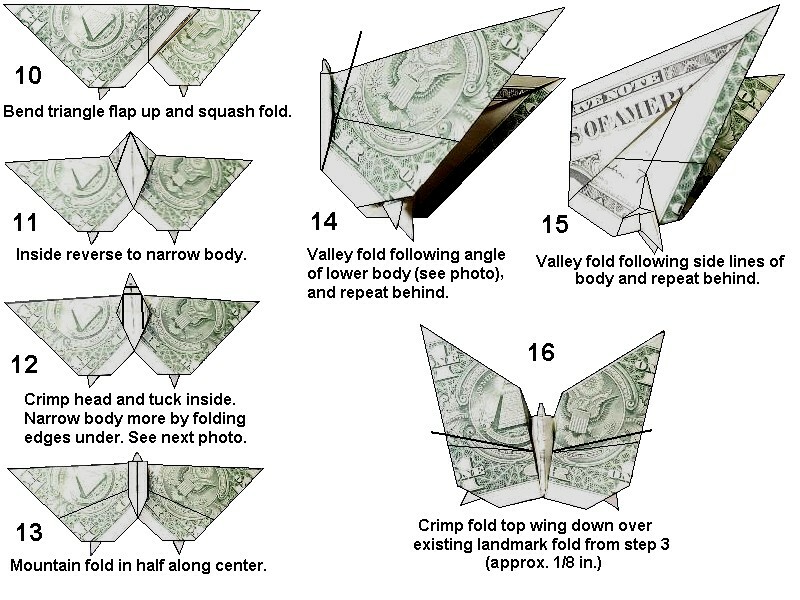 This is the model that inspired the "Father Christmas" model by Steve and Megumi Biddle that can be found in their book, Step-by-step Origami (called Essenstial Origami in the USA). A long, thin modular unit useful for making various geodesic structures. High intermediate. The famous "new" rose by Kawasaki, diagrammed by Winson Chan. Winson learned the rose by reverse-engineering the one that I folded for him. Complex. Stackable modular boxes a la FUSE Tomoko. Intermediate. 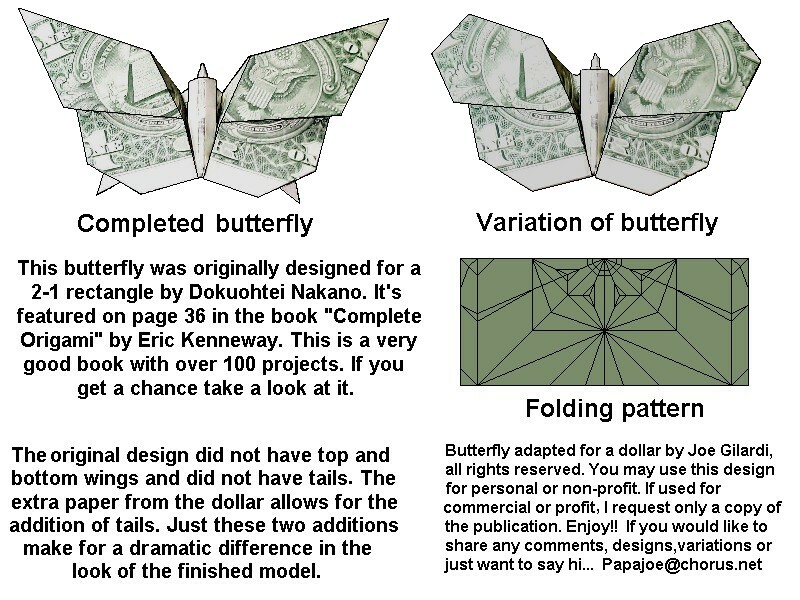 A high intermediate butterfly folded out of an American one dollar bill. The Eiffel Tower, what else? Gigi the cat from MIYAZAKI Hayao's Majou no Takyuubin (Kiki's Delivery Service). Totoro from MIYAZAKI Hayao's Tonari no Totoro (My Neighbour Totoro). A high intermediate dragon. Previously diagrammed in Mythical Beings by Jay Ansill, these are Marc's original diagrams. In his words, "it would be about time the 'correct' diagrams got propagated." A familiar star fighter from a popular movie trilogy. Diagrammed by Winson Chan. High intermediate. 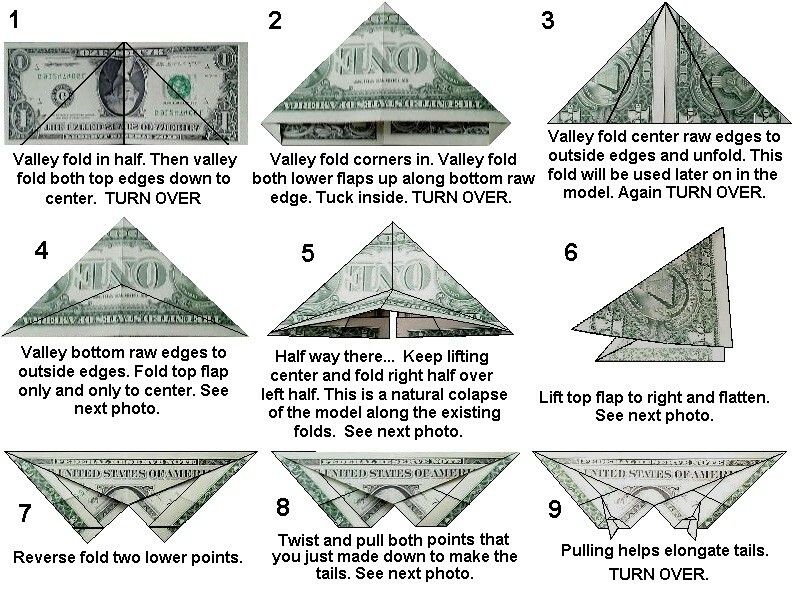 Robert writes: "Any resemblance between this origami design and a character from any irritating-sound-producing videogame, overpriced trading card, or mind-numbing, poorly-animated TV show, is purely coincidental."